Although it was a good vantage point, the guards were always distracted. There was this vague odour of sour cream & onions, and damn, they were hungry. Towers are great tabletop terrain. They offer height advantage and can block line of sight. 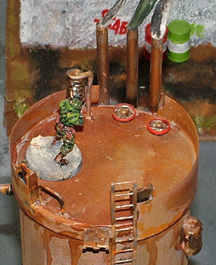 They make great objectives and in some cases become the focal point of the game as every one tries to grab the high ground. Pringles tubes are a great basis for such towers. Be warned though, it will take a couple of turns to get up there. During the time you're climbing you are a ready targets and cannot fire back. A Pringles tube minus the contents. A cigar tube (a biro tube till do). A plastruct ladder (although you can make your own). Odds and ends from your bits box. Various coloured car primer sprays. Use the cigar tube to measure a slot in the side of the Pringle tube The cigar tube should to sit in the hole, protruding slightly. Cut the slot and glue the cigar tube in place. Remove the plastic cap and put to one side. Take your CD and rough up the side with the print on it with some sand paper. Once dry you can flock the base with your choice of flocking material - I use dried tea leaves. Once dry give the flocked base a couple of coats of watered down PVA glue to seal it in. Next decide where you want your pipes to go. Glue your straws into holes cut into the tube with a craft knife. I placed some upwards, open to the sky acting as vent pipes. I also added an outflow pipe from the side. Attach your ladder. I used 1/50 scale plastruct ladder from a model shop. However you can make your own or use staples to make Iron rungs. After fitting your ladder, glue the plastic top to the top of the tube. Take your old drink can and cut it open. Be careful as the edges are sharp.I cut some strips about 20mm wide, and glued therm on top of the tower to form the guards. Add whatever details you want from your parts box. Two turn wheels were added to the top made from snap fasteners. I also put a turn wheel on the side, an exhaust from an old 1/35" tank, a coil from an old radio and a part from a fish tank air hose assembly. I took it outside and sprayed it grey with yellow and red overspray. Always spray aerosols in a well ventilated area. Be patient here. Slowly build each level of spray until you are happy with the result. The pipes were painted and turn wheels were painted with gun metal and dry brushed in with chain mail. The outsides of the turn wheel were painted red. Add whatever details from your parts box. I put a turn wheel on the side, an exhaust from an old 1/35" tank, a coil from an old radio and a part from a fish tank air hose assembly. Dry brush your base with a colour of your choice. I added a run of PVA glue from the over flow pipe. Once dry I ran another layer of PVA over it. I did this at least four times until the PVA was of sufficient thickness. I also added some extra PVA glue to the base to form a little puddle, which I painted bright green.. I glued some cotton wool into the vent pipes, and some markings. "ESD" stands for Emergency Shut Down. The 'Lambda 10' sticker I got from an old tank kit, while the other sticker came from an electrical cabinet. 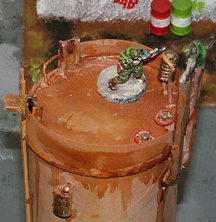 I ran a watered bestial brown and red mix down various surfaces to give the tower a weathered effect. Take the cotton wool in the tubes and stretch to look like smoke being force out of the pipes. Now paint in a colour of your choice. I used a watered down black. And that's it. Another cheap piece of terrain for your table.